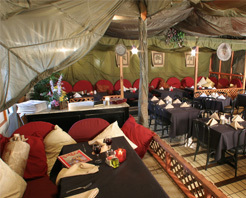 Sinbad is truly a unique place to dine and experience culture in the valley of the sun. Nestled in the southeast valley of Phoenix, Arizona, you'll find Sinbad, a sparkling jewel in the crown of Arizona cuisine. The moment you enter Sinbad you are transformed to a magical place and you feel the presence of tradition, culture and the warm hospitality of civilizations past, merging with today’s diversity and originality. So be yourself bring your friends and sink into relaxing plush cushions, or elegant dining table, enjoying award winning middle eastern cuisine . Let the vibrant beats and tantalizing tastes elevate your mind. Let the exotic blends awaken your senses. After a couple of hours of taking a “hip trip to the Middle East” you’ll feel like Phoenix is a million miles away. A rave among food critics, Sinbad captures the true flavor of the Middle Eastern dining experience and holds its guests captive with delicious food and the highest rated belly dancing performances in Arizona. Sinbad Restaurant is the premier locale for Middle Eastern entertainment, offering live belly dances shows Wednesday thru Saturday with the Top Belly dancers in Arizona that are exclusive only to Sinbad. Sinbad’s exotic cuisine and exotic atmosphere makes dining a feast for all your senses. Authentic, savory, mouth-watering and delicious are all words used by the dozens of loyal customers to describe the vast array of Middle Eastern delights at Sinbad Restaurant. At Sinbad, fresh is always the flavor of the day. Sinbad offers fine Lebanese Wine, along with beer and full bar spirits. If you want to dine on the pillows, call ahead. Reservations are definitely recommended.